The Battleship USS North Carolina now has a new call NI4BK (vanity call with WD4OIN as trustee). The new call will only be used during special event operations from the battleship. 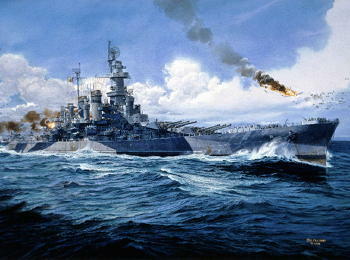 The original call of the Battleship during her war years was NIBK. Much of the original radio equipment on the ship is under renovations by members of the Azalea Coast Amateur Radio Club. Click on the links to find out more. The club started a partnership with the battleship in 2000. We started restoring the TBM-4 Transmitter followed by the TDE Transmitter, Receivers,1MC Intercom System and Telephone system. We are currently working on another TBM-4 Transmitter. We also assist the battleship in their functions, hidden battleship tours ,and school tours focusing on radio education. The ship provides us with a great operating location, allows us to use the ships equipment( transmitters and receivers ) and provides us the opportunity to learn about early radio equipment. In 2009 the club and the ship initiated a guest operator station aboard the battleship for use by out of town hams.Guest operators can contact either the ship or the club for more information. This partnership has helped both the battleship and the ACARC.